Excavations by Open University students that could point to the origins of Stonehenge, have been nominated for Research Project of the Year by Current Archaeology magazine. You can vote for the project, which is called Vespasian’s Camp: Cradle of Stonehenge? on the Current Archaeology website here. The project is led by OU tutor David Jacques who has recruited more than 100 OU students to work on the site, alongside volunteers from the nearby town of Amesbury, since the dig began in 2005. The ongoing dig, at a previously unexplored site 1.5 km east of Stonehenge, is uncovering evidence which suggests the area was an important centre for Stone Age hunters several thousand years before the famous stone circle was built. 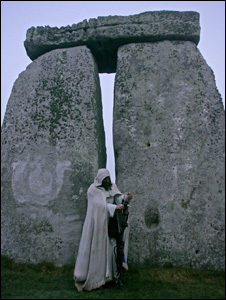 “Many experts are now wondering if Stonehenge is where it is because of this new site, because radiocarbon dates obtained from it show a continued use of the site from the 8th millennium BC through to the 5th millennium BC,” says David Jacques. “This is the longest continually used place yet found in the Stonehenge landscape, and it connects the hunter-gatherer Mesolithic period to close to the Neolithic period, when Stonehenge starts to be constructed. The excavation team have uncovered the largest cache of Mesolithic tools ever found in the area, together with evidence of gargantuan Stone Age feasts. They’ve also found weapons and other objects left as offerings to a god or goddess during the much later Bronze or early Iron Age, suggesting the site had a sacred tradition stretching over thousands of years. The dig has also inspired the local community to create a museum at Amesbury to house the finds. To find out more see the story here where you can watch a video and follow links to press reports.